wise world media, a san francisco-based video production house specializing in work for non-profit organizations, hired me to produce storyboards for a project they were pursuing. they were putting together a short training video for lighthouse, a group that works with the blind and the visually impaired. the video would show the steps a sighted volunteer goes through when being shown how a visually impaired person deals with the everyday world. volunteers are blindfolded and led by a visually impaired trainer, who takes them through simple activities such as crossing a street or eating at a restaurant. 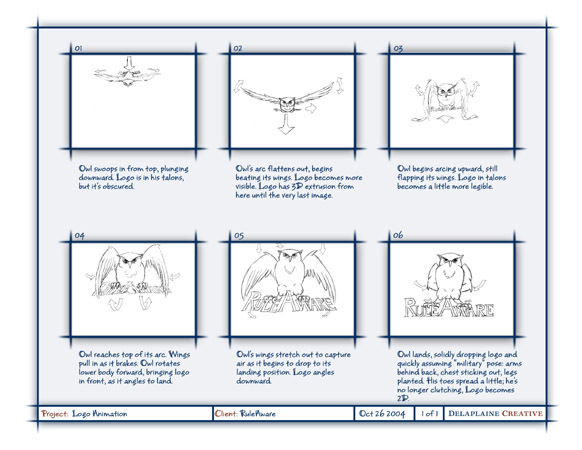 presented here are storyboards for the main portion of the video. click on any thumbnail to see a larger version. i was hired once again by wise world media to put together storyboards for a pitch to the contra costa county first 5 program. this taxpayer-funded group helps children who are at risk for poor-to-no education within the first five years of their lives. they developed a program called tigo, which is comprised of various learning aids and guide-sponsored tutorials. the tigo group wanted to produce a dvd that would show parents how to use the various tools in the tigo kit, as well as how to encourage their children to learn in everyday situations. these storyboards reflect the various chapters of the dvd and the concepts they present to parents. click on any thumbnail to see a larger version. this multimedia company based in alameda, ca hired me to create images involving a promotional video for pharmaceutical company medtronic. the short piece depicted an older father and his young daughter walking through the woods, emphasizing activies that could be painful if left untreated. these boards were done in full color, to maximize the visual effect for the client. this san francisco-based multimedia company was hired by oracle to create a video for the oracle fusion roadshow. they contacted me to create storyboards to show the setup for the two main characters in the presentation. these boards depict a london designer communicating via computer with his banker. click on any thumbnail to see a larger version. this is a cartoon based on my little pint-sized feline queen, corfu. (she actually came from the greek isles!) she quickly set about claiming the throne of matriarch in our household, expanding her territory to include several houses within our block. her escapades are so entertaining, i've been working on a movie starring corfu and our other cats, as they perform their usual hijinks. presented here are the storyboards for the opening, where she breaks into her theme song as she starts her busy day. click on any thumbnail to see a larger version. this software company, after approving the new logo design I helped create while at delaplaine creative, wanted a short animation of the owl. we decided it would involve the owl swooping down and in, coming to rest on the letters spelling the company name. i drew up a storyboard to visually depict this flow for the overseas shop that was to create the animation.